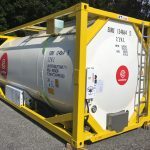 Shipping and logistics companies use Klinge Corporation refrigerated tank units to transport hazardous and non-hazardous chemicals, pharmaceuticals, food products, and beverages, among other products. We have been serving companies around the world for over 30 years, and we have a longstanding reputation for reliable products that deliver excellent long-term value. Keep reading to learn more, or contact one of our specialists today for more information. Klinge Corporation refrigeration units heat and cool cargo by circulating brine or synthetic oil around a tank’s external cooling coils. 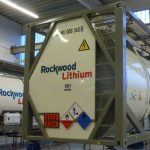 Our units have a stated cooling capacity of 32°F (0°C), depending on the tank details and the options selected. 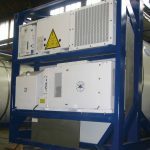 All units have the option of heating between 5 to 20 kW. Visit individual product pages for detailed specifications. One of our most popular products, the TCR-109 is a versatile tank container refrigeration unit capable of meeting the demands of various industrial applications. It is easy to install, is low maintenance, and features an advanced microprocessor control that is intuitive while allowing for precise temperature adjustments. The TCR-109 is also extremely quiet and reliable. The TCR-110 is a high-capacity reefer unit that delivers 7 kW of cooling power at 0°C. It is highly compact and weighs as much as 50 lbs. less than comparable equipment. We offer several configurations of this product: purchase the base model, upgrade to a dual-redundant system with an automated backup unit, or add on a 12 kW heater, among other upgrades. On its own or with the optional nose-mounted generator set, the TCR-104 provides reliable performance, day in and day out. With the gen set installed, the unit will maintain a stable temperature during transit and any other time when shore power is not available. Choose the TRC-262 dual redundant refrigeration unit for 100% security when transporting temperature-sensitive cargo. 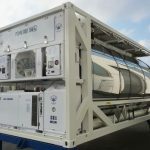 The addition of a second reefer unit with independent thermostat control ensures required parameters are met at all times. If internal temperatures fall outside a specified range, a set of visual, audible, and remote alarms warn you that immediate corrective action is necessary. Food and beverage: It is essential that seafood, as well as fresh, processed, and frozen meat products, are kept within a specific temperature range. Improper temperature control can create ideal conditions for food-borne pathogens, which opens your organization to product loss, fines and liability issues, and reputational damage. For these reasons, the U.S. Food Safety Modernization Act outlines strict guidelines for shippers, receivers, loaders, and carriers who deal with perishable foods. Our products are essential to meeting your legal requirements and managing risk across the supply chain. Pharmaceutical: Vaccines are just one of the many pharmaceutical products that require transportation in refrigerated trucks. Each year, an estimated $300 million worth of vaccines are destroyed as a result of improper storage. Klinge Corporation refrigeration units are designed to meet international standards for temperature control. Our dual redundant products provide peace of mind and performance you can count on at all stages of the cold chain. Military: Food, ammunition, medicine, and supplies used by the military are governed by strict regulations concerning transport and storage. Maintaining stable temperatures is essential, particularly when working in hot climates where access to proper refrigeration is unreliable. Both U.S. and international armed forces, as well as government contractors and non-governmental agencies, use our refrigeration units. We can customize any product to your exact specifications. Other potential applications include oil and gas, chemical processing, and general manufacturing. Whatever the task, count on Klinge Corporation for some of the most reliable, compact, and sophisticated products on the market today. To learn more about the role our reefer units play in industries and organizations around the world, keep browsing our website or contact our office to speak with a representative directly.